Some bookmakers have weekly free bet clubs as a reward for your loyalty and to keep you betting with them. You can take advantage of these offers in the same way as the welcome offers by simply betting a certain amount to unlock the free bet. These really are no-brainers to do as they are very straightforward. They are simple Bet X Get Y offers which take no time at all, and they can be repeated every week! I would just recommend reading each of the guides to become familiar with the club mechanics so you can incorporate it into your Matched Betting routine. In total this is an easy £30+ profit risk free every week! 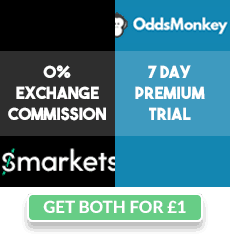 To complete the Coral and SkyBet clubs in under 3 minutes, I'd recommend checking out our OddsMonkey Time Saving Tip #2. The Team Hustler bet clubs are slightly more advanced as a lot of them include multi bets which cannot simply be laid off in one go at Betfair. They also tend to take more time and effort however are still worth it if you're looking for a decent hourly wage. The best way to attempt these is to try to combine them with an offer where possible. For example, if the offer is bet 10 x £10 a week, try to complete other offers within the time frame, and any remaining bets needed to complete the bet club can then be done a day or two before the deadline.